Before the main construction can commence, foundations, drainage, the ground floor etc must all be correctly installed. Novia supplies two damp proof membranes products (DPM membranes) offering radon gas and methane gas protection. Each membrane, as it increases in protection level, will also protect against the level beneath. For example, methane barriers protect against damp, radon, carbon dioxide, as well as the methane gas they are installed to combat. Novia have worked to ensure that our Methane Pro membrane is suitable for use with BS 8485 installations. This membrane has been tested fully, including joints, to ISO 15105-1. Full details regarding this product can be found on the individual product page and datasheet. 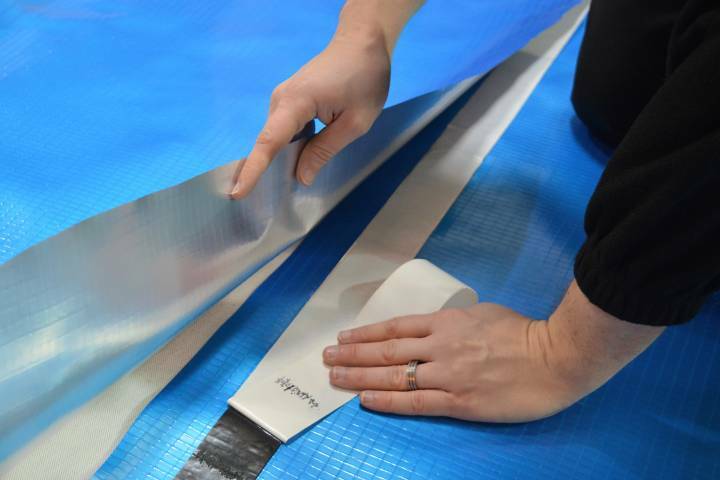 All gas and damp proof membranes should be installed using the Novia Double Tape Sealing System, which uses Novia Double Sided Butyl Tape (50mm width) and Novia Metallised BOPP Tape (60mm width). Full installation instructions will be found in technical datasheets. Our gas and damp proof membranes are available for specification via NBS Plus and NBS Create software. Full information for these products can be found for NBS specification with the table below. The links will open a pop up window with full specification information. Our Double Sided Butyl Tape is used on the laps and edges of the membrane, with either Metallised BOPP Tape or Aluminium Foil Tape then used to complete the seal, keeping down any excess membrane. Interested in the Gas and Damp Proof Membranes range?